POUR SOME MORE! 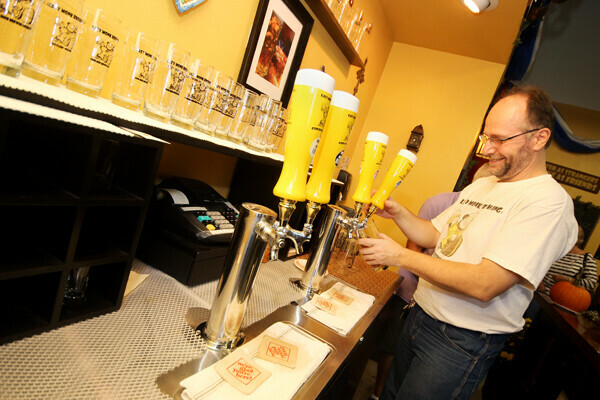 Lazy Monk owner Leos Frank pours a specialty brew at their Oktoberfest celebration. Lazy Monk Brewery has been approved to move from their current location near Banbury Place to a much larger space by the Chippewa River at the corner of Oxford Ave. and Madison St. in the old Charlson building. This last week Theresa and Leos were kind enough to take a quick break in the hectic swing of excitement to answer a few of our questions. Volume One: What is it that first attracted you to this new space? Lazy Monk: We had always thought about a location in the heart of the city. When we heard that the Charleston building was for sale we could not think of a more ideal spot with views of the Chippewa River. This will, of course, mean an expanded taproom, but what other changes can customers expect? We will be going for a truly authentic German/Czech experience for our customers. Since we are in Germany and the Czech Republic visiting our family so often, we feel we can bring that flavor to Eau Claire. We will be expanding our taps from 6 to 12 as well as we will be putting in a German/Czech restaurant to allow our customers to experience not only the biers of Europe, but also the food. How will the ambience of the space match this experience? The feel will be German Bier Hall. With the 8’ family tables to the woodwork on the walls and the German fireplace. We also will have a very large deck that overlooks the Chippewa River allowing for a three season experience. Why was moving to the West Bank important to you? We are very happy to one of the first new businesses moving to the West Bank. There are so many new and wonderful things happening and we feel we will be a cornerstone to it. It is an exciting time for the people of Eau Claire with all the changes happening to bring the downtown back to life and we could not be happier to be a part of it. Do you have anything else to share with the community? We seriously would like to thank all the support we have received from our community. We can’t thank everyone enough for all the positive support and encouragement we have and continue to receive. We know how excited we are and to see that same excitement in our community just makes it all the more special for us.